The Willis Tower is a Chicago icon. I’ll always think of the Willis by its original name – the Sears Tower; as a toddler, my son always referred to it as the “Serious Tower”. Whatever you want to call it, the Willis Tower makes our skyline stand out from afar. 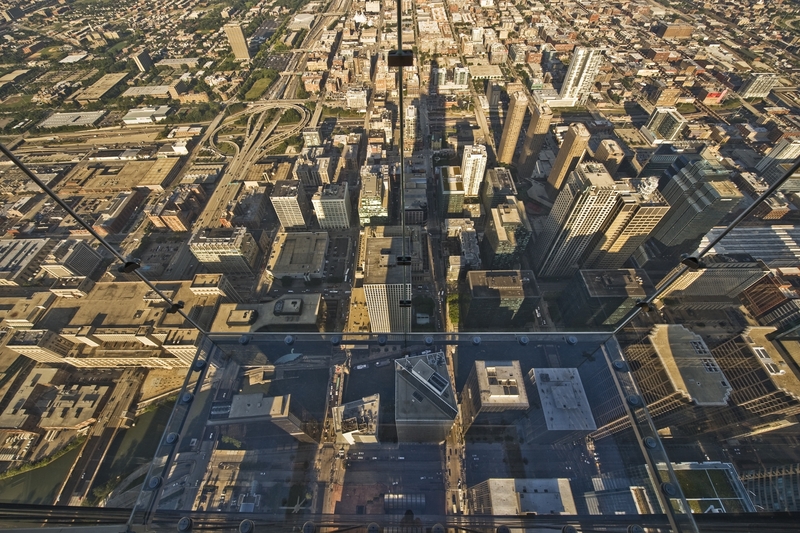 Over 100 stories up the Willis Tower lies Skydeck Chicago – an absolute don’t miss Chicago experience. Open daily, it offers spectacular views – you can see up to four states on a clear day – interactive exhibits and…drumroll, please….The Ledge, a glass box that let’s you step four feet outside the walls of the building. Step onto The Ledge, and you’ll be able to see directly down to the streets below you, where people seem the size of ants and cars are matchbox-sized. It’s simply thrilling to overlook the city from this helicopter’s-eye view. While you’re there, be sure to check out the theater presentation, Reaching for the Sky, which tells the story of how our city built its dazzling skyline. This entry was posted in Family and tagged must-see Chicago. Bookmark the permalink.